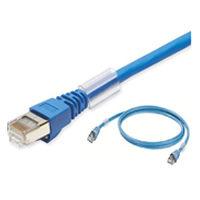 We offer a wide range of computer cable assemblies to meet any electronic application or need. Choose from Parallel, SCSI, Serial, KVM and USB types, among many others, from leading brands like Roline, FTDI Chip, Molex, Bulgin, Harting and our brand RS Pro. What are Computer Cable Assemblies? A cable assembly is a collection of wires or cables, arranged into one, single unit. There are two main types of wire / cable - data and power. A data cable carries informational signals from one device to another and a power cable carries electricity to a device. Several such cables can be grouped together to make a cable assembly, often covered in a sleeve, providing protection to the assembly as a whole. Doing this helps organise them (preventing tangling) and makes them easier to install, maintain and replace. Used in many applications and often found in construction equipment, vehicles and industrial appliances, cable assemblies can also be part of heating, ventilating, and air conditioning (HVAC) equipment and RF, serial, Ethernet and high-speed connectivity applications. USB Cable Assemblies - allow for simple "plug & play" connections for devices such as keyboards/mice, digital cameras and printers. Digital Video & Monitor Cable Assemblies – allow different connectors at each end to connect visual displays. KVM Mixed Cable Assemblies - KVM stands for Keyboard, Video & Mouse. These assemblies allow users to control multiple computers with one keyboard, video monitor and mouse set. The user would have a KVM switch to swap from one computer to the next. Serial Cable Assemblies - used for data transfers between computers via serial communication protocols (data sent one bit at a time). Serial cable assemblies mostly use the RS-232 (Recommended Standard 232) interface specifications. Parallel Cable Assemblies - These connect two PCs via parallel ports. Parallel cable assemblies allow multiple data blocks to be transferred simultaneously from one device to another, which increases the overall transfer speed.